Quick and accurate time tracking to ensure you never have to worry about reconstructing billable time from memory. Easily keep track of the work you do by recording your time as you go. Pause and restart up to three different timers for your daily activities as you jump between cases or when interruptions arise. Also track non-billable entries to monitor the performance and efficiency of your firm's flat fee and pro bono cases. 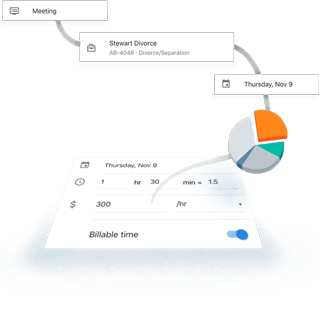 Your billable time isn’t limited to routine tasks around the office. The MyCase mobile app is the perfect portable time tracking tool so that no matter where you are — in the office, in court, or in transit — you can be confident that you’re paid for the work you’re doing. Never worry about pulling numbers from memory or figuring out which of your many time entries link to any particular case. MyCase connects time entries to your cases automatically, consolidating your billed hours seamlessly into your invoices to ensure your clients are billed the right amount every time without any extra manual work on your end.